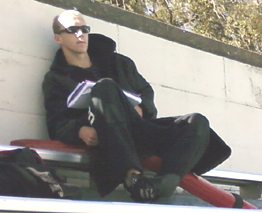 This page is a collection of real, not posed, photos of lifeguards on duty who are not ready to do a rescue, (also known as not whistle worthy) and equipment/facilities also not rescue ready, for discussion in my lifeguard training classes. 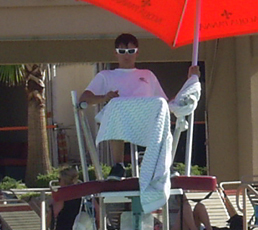 From the copyrighted 2016, released 2017 American Red Cross Lifeguard Manual (and from previous lifeguard training manuals) : “When performing patron surveillance, always keep the rescue tube ready to use immediately. 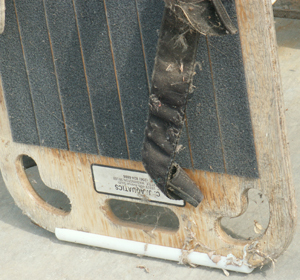 Keep the strap of the rescue tube over the shoulder and neck. 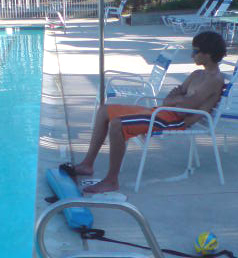 Hold the rescue tube across your thighs when sitting in a lifeguard chair or across your stomach when standing. 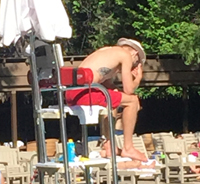 As I watched this pool briefly I saw two other guards demonstrate that they were bored: one was twirling his whistle, and another absentmindedly tapped her rescue tube in her lap as if it were a bongo drum. When some of these guards rotated and changed positions they did not make certain that the pool zone was being watched by at least one of them the whole time. 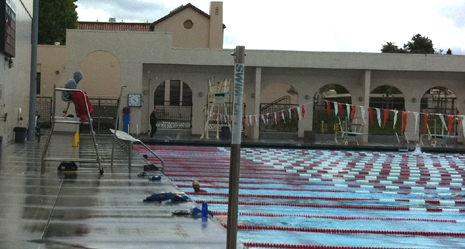 Ken Mignosa took the first photo on the left Saturday, July 22, 2006 at the JSSL (Junipero Serra Swim League) Championships his son was competing in. The photo to the right of it is at a national park hotel swimming pool. There were only a few people swimming that morning. 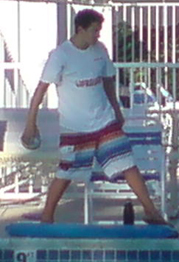 These photos were shot at a different national park pool in 2010. 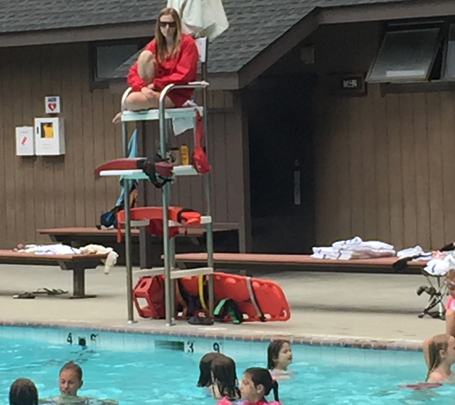 When the lifeguard came on duty (the only guard on duty) there were two people swimming laps. When she got out a book and started reading one swimmer got out of the pool to take the picture. were overconfident about the swimming skill of the pool patrons? 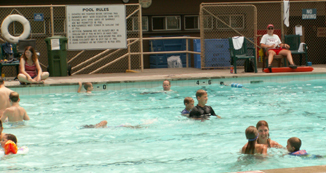 People have drowned at pools where there were lifeguards on duty. 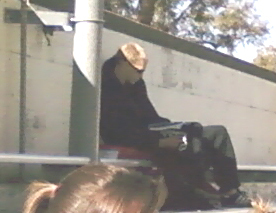 One of the main reasons is inattention to actually guarding the pool full time. “Avoid socializing while on duty. When I watched this National Park swimming pool in June 2017, for over fifteen minutes, one man and two women in lifeguard t-shirts and/or red shorts were at the pool. 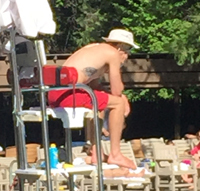 One woman, in a lifeguard t-shirt, shown only in the background in one of these photographs, was arranging chairs along the deck and looked at the pool only rarely. A second woman was initially standing on one side of the deck, with her rescue tube up on the lifeguard stand, instead of on her person. A man was sitting in the lifeguard stand on the opposite side of the deck, using his rescue tube as a backrest. In the pictures below you can see the strap of his tube wrapped around the tube, instead of having the strap around his neck, across his body and the tube in his lap, ready to use, as he was trained to do. A bit later the woman standing on the deck left her rescue tube on the stand and walked around the pool to the other side of the deck and talked to the male lifeguard for almost ten minutes (with neither of them watching the pool some of the time). 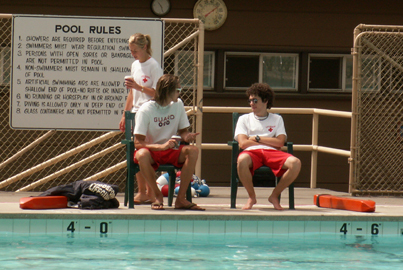 On the left, at a California State University, a lifeguard on duty with her feet on her rescue tube. My students tell me they have seen guards at this facility with their feet on their rescue tube AND talking on a cell phone AND eating lunch, at the same time. 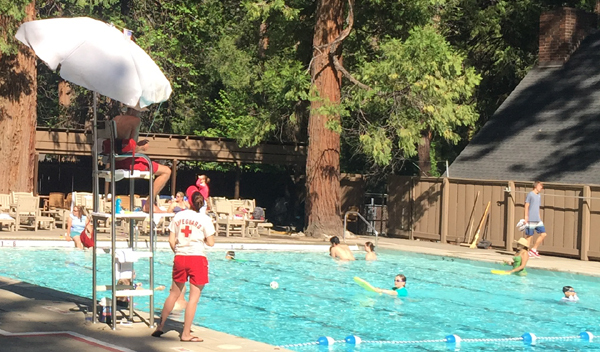 To the right, a lifeguard at a California Bay Area private university, with their feet on their rescue tube, instead of having the tube ready to go in their arms. The lifeguards at these facilities are often on duty alone and responsible for an entire Olympic sized pool, about 25 yards by 50 meters. There is no position you can guard from at that size of pool that allows you to see the entire surface and bottom of the pool. 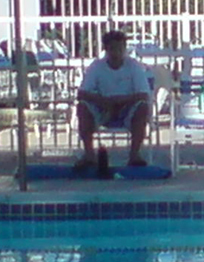 The person who took the next photos (a lifeguard) was attending classes held in the pool. 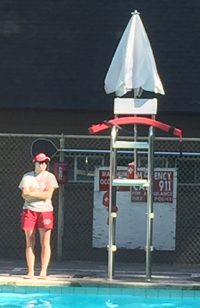 This lifeguard on duty at a University of California campus is sitting far up in the pool side bleachers and can’t see the whole pool bottom. He would not be able to get to the water quickly to do a rescue, and would seem to have his eyes on something in his lap rather than on the water (see the closeup in the second photo). 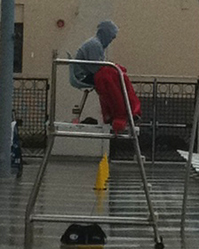 This photo of a lifeguard at a high school was taken on an iphone, so it was difficult to enlarge the close-up, but the end of the red rescue tube is visible under the guard’s jacket he has draped over his legs on a cold morning, June 2011. Below a picture of a pool office with a big corner window that would allow the manager to watch the guards/patrons/lessons, except that it has so many flyers posted in the windows, and a big display just outside, that the view is blocked. How long do you suppose this backboard has been sitting out in the sun unused at a local private swim school for the velcro to warp and this many cobwebs to form? How long since they did any in-service training (practice) with it? Where do you suppose the head immobilizer is? 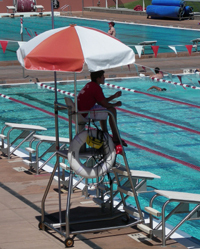 Lifeguards need to guard from lifeguard stands or the edge of the deck where they can see the whole surface and the entire bottom of the area they are responsible for. 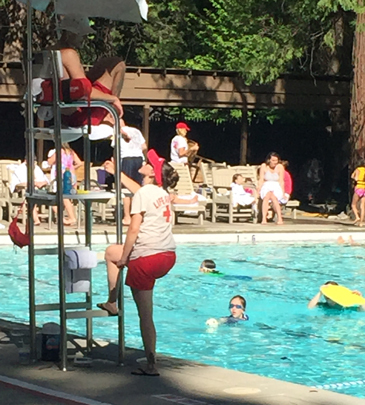 XYZ Tennis & Swim Club is looking for a CPR, first aid and water safety certified lifeguard for hours at the xyz Rec pool in Xyz Valley. Hours are flexible, however we are primarily looking for morning (approximately 7 – 9am) or evening hours (6 – 8pm). There may be a need for some mid-day and weekend hours as well if you are interested. 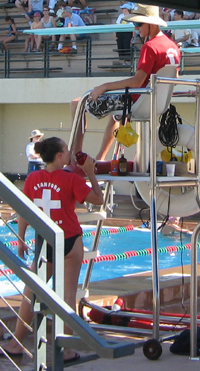 Duties include opening and closing the pool, signing-in and supervising recreational lap swimmers, covering the pool at night, testing the pool chemicals at least once during a shift, and some light maintenance.